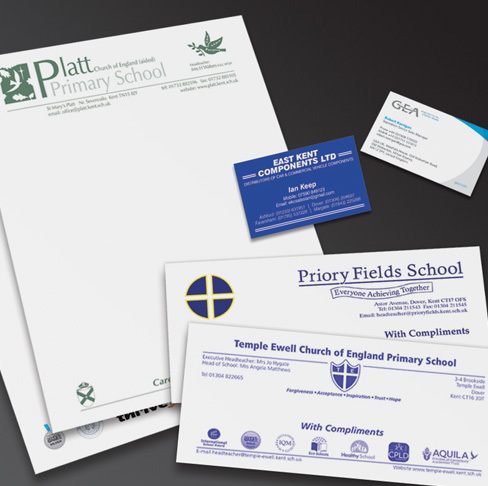 Our office stationery covers mainly letterheads, compliment slips and business cards. Having these products pre-printed with your school logo, with the accreditations gained and in the correct school colours, not only saves you time and effort but raises the profile of the school, giving it a more professional image. Letterheads are generally produced at A4 size although, they are available in A5. A huge variety of papers are available, but generally 100grm white laser guaranteed paper would suit most needs. Watermarked papers are available at a premium. We are able to print anything up to four colours in one pass with printing on the reverse if required. Everything we print is bespoke, which doesn’t mean expensive, it just means you get exactly what you want. Each job is priced on application, with delivery and design included, Barrett Print will take away your print headaches! Please call 01474 564738 for a price or email sales@barrettprintforschools.co.uk to arrange a visit. They always deliver good quality work on time and on cost, and represent excellent value for money.